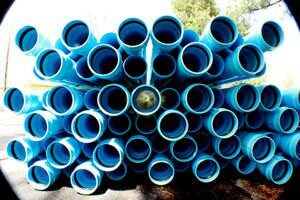 Both ABS and PVC are used in pipes because they are non-toxic and resistant to abrasion. 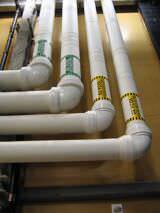 ABS pipes are easier to install compared to PVC pipes, but also more likely to deform when exposed to the sun. ABS stands for acrylonitrile butadiene styrene and PVC stands for polyvinyl chloride. PVC and ABS pipes are resistant to most acids, alkalis and salts. However, they are not resistant to aromatic and chlorinated hydrocarbons. Both types of piping can be used above or below the ground, but ABS is more likely to deform when exposed to the sun. Because of this, some local regulations require ABS pipes to contain pigments to protect it from UV radiation or to be painted with latex paint. PVC is usually made softer and more flexible by the addition of plasticizers. ABS pipes are easier to install than PVC pipes, as PVC pipes need a purple primer before each joint is glued together, and the joints must then be held together for 5 to 10 seconds for the glue to take hold. ABS is used in drain-waste-vent pipe systems and sewer systems. It is also used as electrical insulation. PVC is also used to produce pipes such as for drain-waste-vent systems and for insulation on electrical cables. ABS is also used to create musical instruments, golf club heads, car bumpers, protective headgear, whitewater canoes, luggage, kitchen appliances and toys, including Lego. It is also used as a colorant in some tattoo inks. PVC is also used in clothes, especially to create leather-like or waterproof material, in toys, car interiors, vinyl flooring, shower curtains, and many other plastic products. ABS piping has a higher impact strength than PVC, especially at lower temperatures. However, ABS can deform under sun exposure. ABS is highly durable with high impact strength. PVC is less durable, as it is designed to be flexible and softer than usual plastics. However, both plastics are resistant to chemical and water degradation. A 2in x 2ft ABS pipe costs $5.79 on Amazon.com. A 1in x 2ft PVC plain end pipe costs $9.99 on Amazon.com. PVC-coated wires can form HCl (Hydrochloric acid) fumes in a fire, which can be a health hazard. Plasticizers may leak out of PVC into the environment. The EU have now banned 3 types of phthalates used in PVC: DBP, BBP and DEHP. Neither ABS nor PVC is biodegradable. ABS Plastics - Go Polymers, Inc. I think PVC should be chosen as "Plastic of the 20th Century"
PVC is cheaper than ABS, is pressure-rated (pressure rated ABS is less available and far more expensive), and can be fused (glued) by solvent welding, whereas ABS can be only by ABS cement.